FRISCO, Texas (Sept. 6, 2017) - The Frisco RoughRiders Foundation raised $30,856 for Hurricane Harvey relief throughout the team's final homestand of the regular season, which ended Sept. 4. The proceeds will be donated to the American Red Cross. "The outpouring of support for those impacted by Hurricane Harvey over the last week is truly inspiring," RoughRiders Chief Operating Officer Scott Burchett said. "We're so proud to witness the tremendous generosity of RoughRiders fans and their unwavering assistance for our neighbors along the southeast Texas coast." The RoughRiders, the Double-A affiliate of the Texas Rangers, employed several fundraising efforts during the seven-game homestand, including 10 percent from all sales at the Riders Outpost team store, proceeds from special Pass the Boot activities during games, cash donations at the RoughRiders Foundation table and auctions of RoughRiders items. 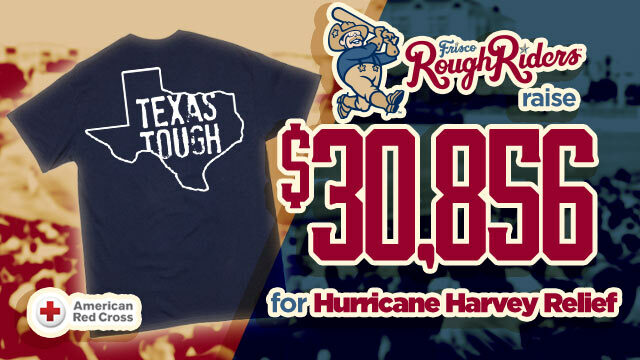 Riders Outpost also has limited edition "Texas Tough" T-Shirts available both in store and online for a minimum $10 donation to the American Red Cross' Hurricane Harvey relief efforts. More than 1,000 t-shirts have been ordered and will continue to be available at roughriders.milbstore.com through Friday, Sept. 8. Fans can visit www.redcross.org/donate/cm/friscorr-pub for more information and to continue to donate. Donations through the American Red Cross are welcome by texting HARVEY to 90999. The mission of the RoughRiders Foundation is to enhance the community we serve through charitable contributions, grants, and programming initiatives. The RoughRiders Foundation supports programs and organizations in our community that motivate and reward children and families in the areas of education, good health and community services activities. For more information on the Frisco RoughRiders Foundation, contact Breon Dennis at breon@ridersbaseball.com or at community@ridersbaseball.com. The Frisco RoughRiders are the Double-A affiliate of the Texas Rangers and play their games at beautiful Dr Pepper Ballpark in Frisco, Texas. The team was founded in 2003 and has finished first among all Double-A franchises in attendance in each of the last 12 seasons (2005-2016). In August 2014, the RoughRiders were purchased by an ownership group led by Chuck Greenberg. The new ownership group, together with the city of Frisco, has spearheaded numerous major franchise improvements over the past two seasons, investing nearly $8 million in a wide array of facility upgrades and improvements, including a new state-of-the-art HD video board, sound system, Bull Moose Saloon, InTouch Grille, Riders Outpost Team Store and the newest and biggest creation, the 174-foot Choctaw Lazy River. The upgrades made prior to the 2015 season earned the Riders and the City of Frisco "Best Ballpark Renovation" of 2015 by Ballpark Digest. The same publication also honored the Choctaw Lazy River as the best ballpark improvement over $1 million for the 2016 season. More than 140 former RoughRiders players have gone on to play Major League Baseball, including All-Stars Chris Davis, Adrian Gonzalez, Ian Kinsler and Nelson Cruz, as well as current Rangers stars Elvis Andrus, Rougned Odor and Nomar Mazara. For more information on the Frisco RoughRiders and Dr Pepper Ballpark, please visit RidersBaseball.com or contact Art Garcia at AGarcia@RidersBaseball.com or Ryan Rouillard at RRouillard@RidersBaseball.com.